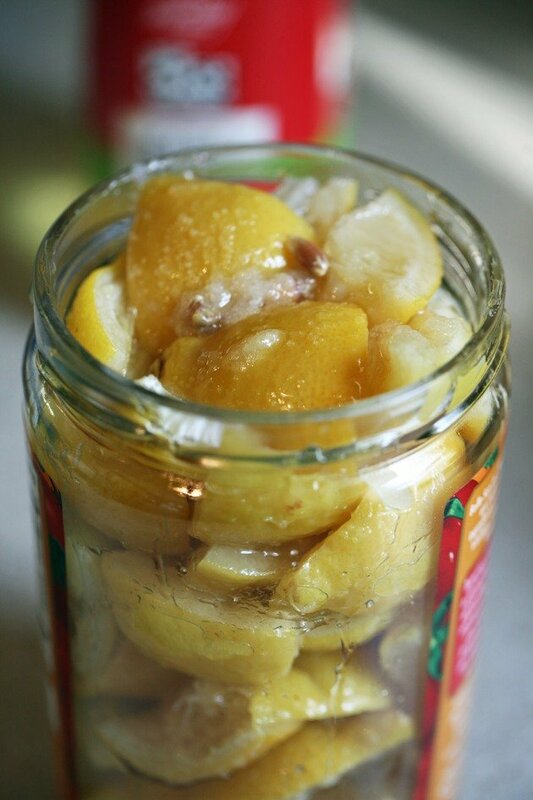 In this post, I’ll show you how to preserve lemon peel. There are a few ways to do this, but in this post, we are going to use oil and salt for this preserved lemon rind. It’s delicious! 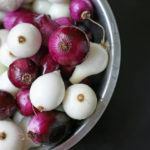 I love eating it with any chicken or fish dish or adding it to any sandwich. It lasts forever and is very simple to make. You can find the printable preserved lemon peel recipe at the end of this post. Why the heck would you bother preserving lemon peels? Well, because they are so delicious! Besides, the chickens won’t eat them and they take forever to compost, so in my belly they go. Preserved lemon peel is a Middle Eastern/Moroccan kinda dish. In Israel, we don’t use salad dressing as much as we use it here in the U.S. Most of the time when we make salads we dress them with olive oil, lemon juice, and salt. It’s so simple, so tasty, and so much healthier than all those dressings that have a ton of mayo in them. And we eat a salad with almost every meal in Israel! So what is one going to do with so many lemon peels at the end of the week? You can cook them with celery or fennel or carrots or kale. 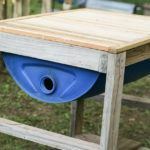 You can put them in the food processor and turn them into a lemon paste which you can spread on bread, or chicken or fish. Really, the possibilities are endless. First, acquire a few lemons. Let’s say, you used the juice for cooking or salad or whatever, instead of throwing away the peel, place it in a zip-lock bag or a container in the fridge. 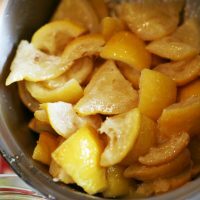 Just a side note here, you can keep the lemon seeds and use them in jams since they have natural pectin in them and will thicken your jam naturally (I show how to do this in my Peach Jam post so make sure to check it out). 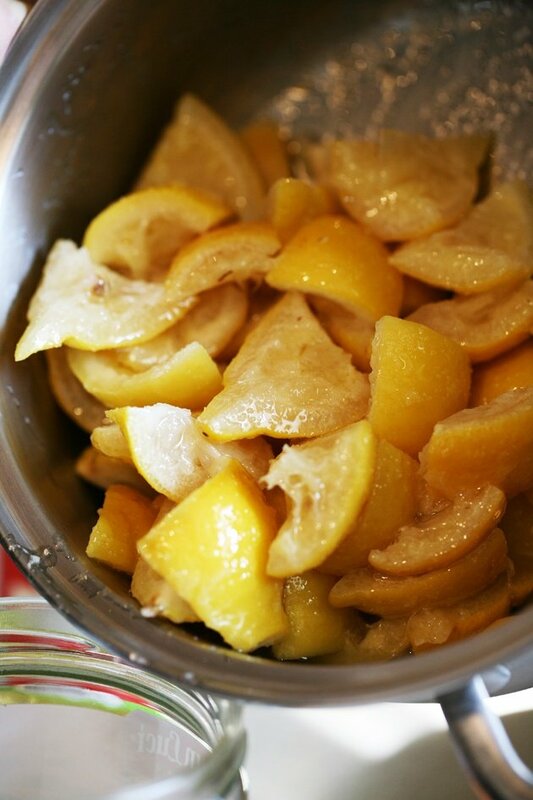 Back to preserving these lemon peels… Once you have a few lemons, cut them into small pieces. We used about 6 lemons here, I think, and we cut each lemon into 8 pieces. You can go smaller or larger with your pieces, there are no rules. 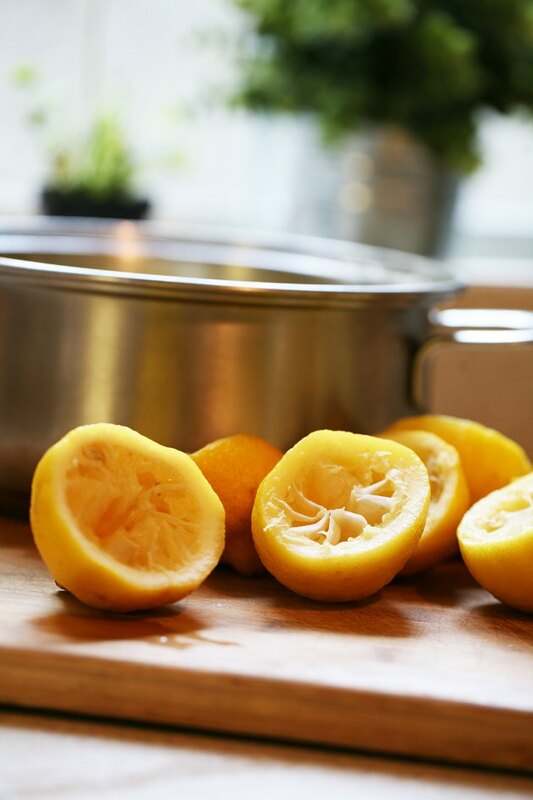 Place your lemon peels in a pot and fill it with water. Place your pot on the stove top and bring the water to a boil. Lower the heat but keep your water boiling gently. We want the peels to soften, this might take 30 minutes or maybe 45, depending on how thick your lemon peels are. Keep checking the softness with a fork just as you do with potatoes. Once the lemons are soft, transfer them to a strainer or a colander and let them dry and cool a bit. Until the lemons are all coated with the oil and salt. Then all you have to do now is transfer the lemons into a jar and keep it in the fridge. They are ready to eat. 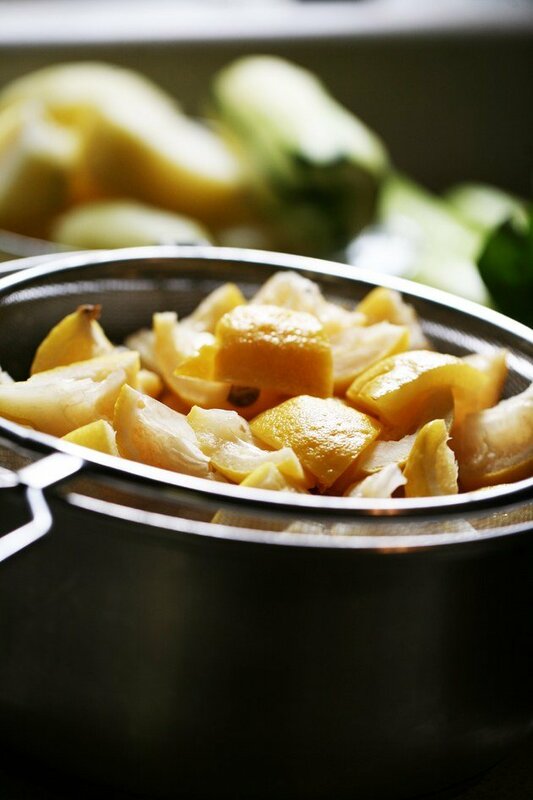 The reason we boil the lemons is that we want them to be ready to eat right away. The reason we keep them in the fridge is that we want to use a smaller amount of oil. If you want to keep your jar at room temperature you would just have to add some more oil and make sure the lemons are covered. If you don’t want to boil the lemons you can cut your lemons, put some salt in a jar, then a layer of lemons, then a layer of salt, then a layer of lemons and so on until the jar is full. 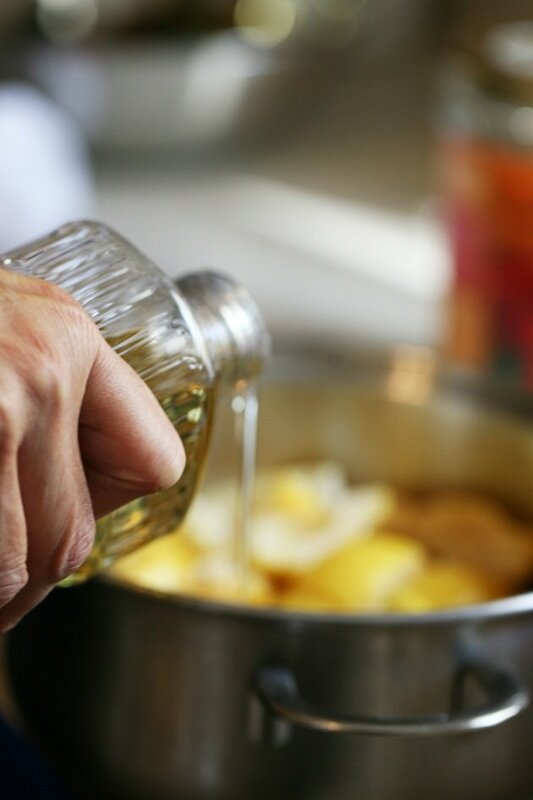 Once the jar is filled with lemons and layers of salt, add oil all the way to the top. If you do it this way you can leave the jar in the pantry but it will take the lemons a couple of months until they soften. Another note to make is that you can add different seasoning to the lemons. 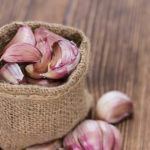 You can add whole cloves of garlic, red pepper flakes, cayenne pepper if you like it spicy, maybe some thyme… Be creative. Also, if you like, you can make this with whole lemons instead of just the peel, just make sure to cut them to smaller pieces. OK, I think I gave you enough options! Now go get busy. Delicious preserved lemon peels in oil and salt. 1. 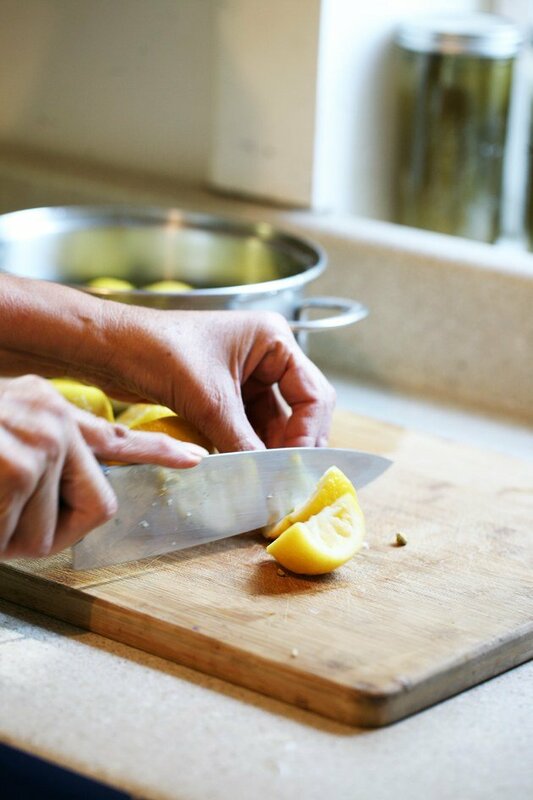 Cut the lemon peels (each lemon to at least 8 pieces). 2. 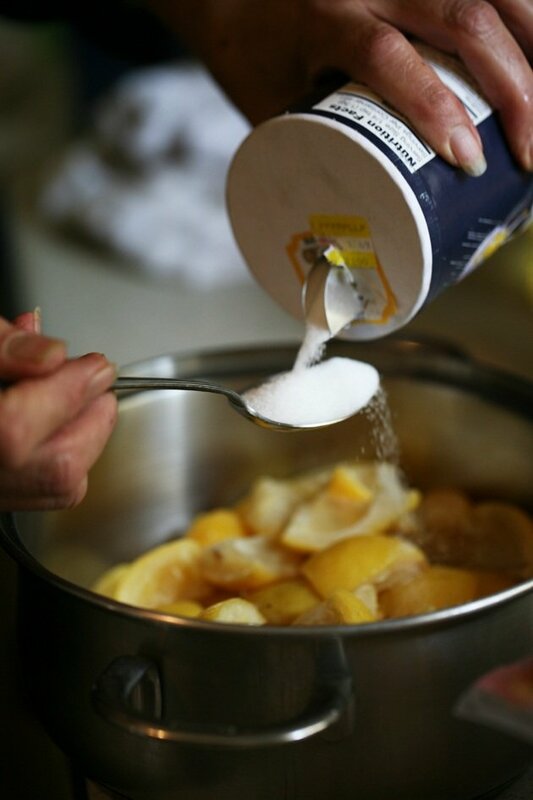 Place the peels in a pot, fill it with water. Place the pot on the stove top and bring to a boil. 3. Lower the heat so the water is boiling gently. 4. 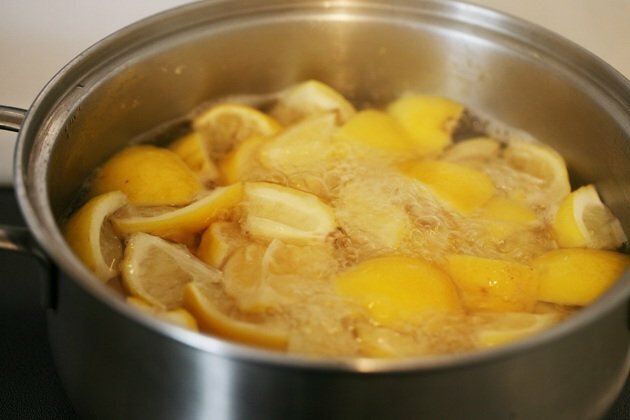 Boil until the lemons are soft (probably 30 -45 minutes). 5. 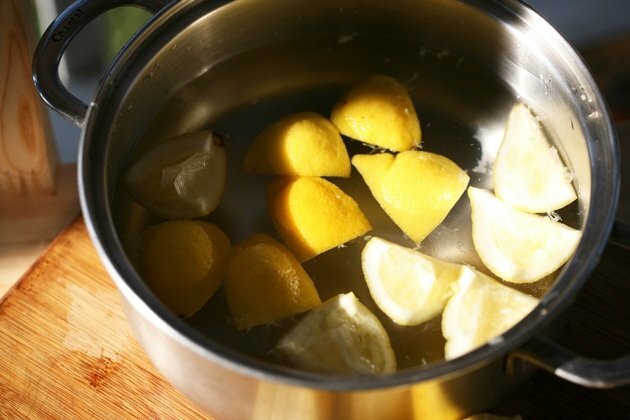 Place lemons in a colander and let them cool down and dry. 6. 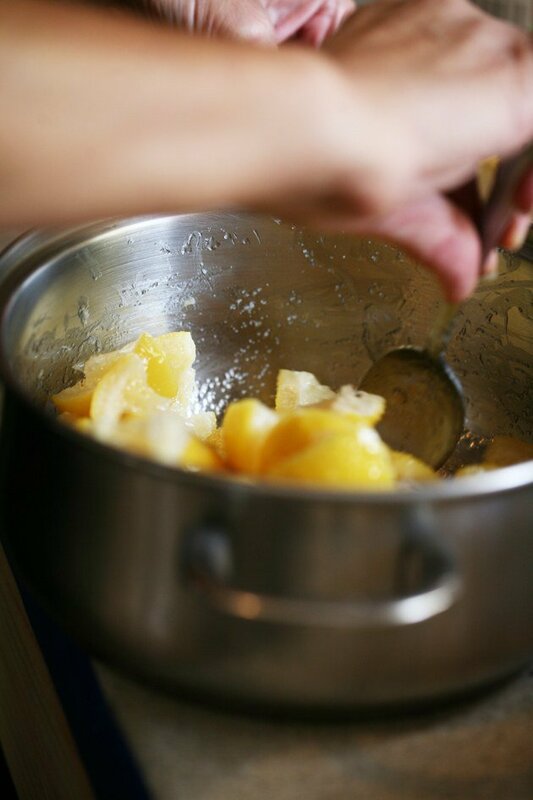 Transfer the lemons back to the pot or to a mixing bowl and add the oil and salt. Mix to coat the lemons. 7. Transfer the lemons into a jar and keep in the fridge. Sounds great, gonna make a try to make! Thanks so much! Can you mince these and use them as you would grated lemon peel? Either way, what a great thing to know how to do with the “leftovers” when you’re just using the juice. I don’t believe it will be the same as a grated lemon. When you mince it, it will turn into a paste. It’s actually nice to use it this way, just spread it on a piece of fresh bread but I am not sure it will be good for baking and such. If you try, come back to let me know if it worked. Thanks for visiting! How are you making the lemon paste? Are you just throwing the boiled lemons into the food processor? Yes, exactly. Throw them in and add oil as the processor is working until it’s reaching your desired consistency. Thanks, these preserved lemon peels sound like a very good thing to have handy. How long do they keep in the fridge? They will keep for many months as long as you make sure to use a clean fork when you grab a few from the jar. Also, make sure that all the lemons are below the oil before you place the jar back in the fridge. Recently, I saw a chicken recipe with preserved lemon and it looked delicious. But, I’ve never enjoyed preserved lemon. I am anxious to try this, but am leery about how bitter this is due to all the white pith. Is this a valid concern? I don’t know if to say that it’s bitter but the lemon peel and pith definitely has a unique taste to them. It’s like extra strong lemon… You’ll have to try and see if you like it, it’s really the only way. But you can make just a small amount to try. How would you use this on a sandwich? Let’s say, mayo, slices of turkey lunch meat (or chicken breast, for example), slices of tomato, and a couple of lemon peels. Delicious! Very good. Always felt bad throwing rinds away.